Friends and followers alike, it’s time for something really special! A cask sample of Laphroaig! The weekend before last I did the Gothenburg Beer and Whisky festival, working for Edrington in their booth and mainly taking care of Laphroaig and Connemara. It is an honour to work with such great people as the Edrington crew! When the festival started to move towards the end I was very lucky indeed to receive from Vicky a small bottle containing a cask sample! ”First fill Makers Mark bourbon cask - Bottled Dec 2013 - Casked 1999 [= 14years old]. The cask number reflects the number of cask filled in that year. The cask is now empty but was used for sampling out of as well as the small bottles that you have. As part of our Distiller's Ware and Water to Whisky program. The Cask was matured in a rack warehouse and was stowed on the top stow. All matured on Islay”. As you can see in the photos, this whisky has not had a bit of filtration! Sounds very nice don’t you think?! Well let’s try it then! 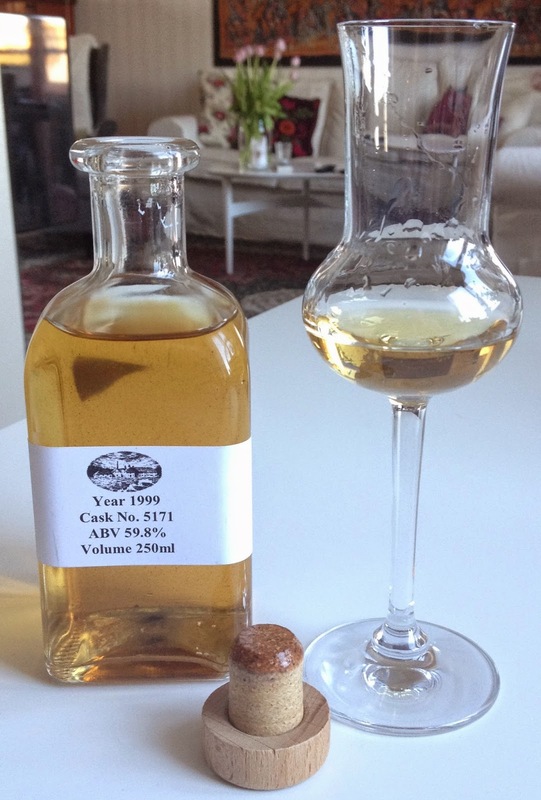 The 1989 17yo for Feis Ile comes back to mind… Mmm… hard to explain, I really want to at the same time as I want to enjoy the moment! ☺ Anyway, loads of really soft vanilla in combination with an extremely soft peaty-ness. In fact I’ve never felt so soft peat in a Laphroaig before. The fantastic/interesting thing is that it is a peaty-ness that goes toward burnt wood slowly moving on into orange chocolate and in the distant we have sweet lemon curd and creme brulee. This combo of vanilla, peat/burnt wood and citrusfruit scents seem to go on forever. With my nose deep in the glass there is not a hint of too much strength/alcohol. I have to nose really deep to experience it as ”high strength”… Oooh my mouth is watering soo bad, it’s time to taste! OMG! Very sweet, almost sugary, for the first half of a second and then BOOM! I never thought it would be that explosive! After the first quite extreme hit of salt and strong peat, it actually moves over into watermelon, grapefruit and orange zest (!) which is a first-time combo for me when it comes to whisky. It almost feels like oranges have been in the cask together with the whisky, a lá limoncello or something like that… ☺ Incredible… There is also some kind om mint, there’s definitely cacao. Everything, a part from the first hit, is veeery smooth and intertwined. Then slowly or gradually getting more and more dry in my mouth, freakishly dry actually, all along the tounge and up the roof of the mouth. The aftertaste sees the burnt wood from the nose coming back, then becoming more and more faint, some touches of ”sweet” ashes (whatever that might taste like) and slowly closing off on leather and vanilla sweetness… Absolutely beautiful! Friends, it’s time for a premiere! 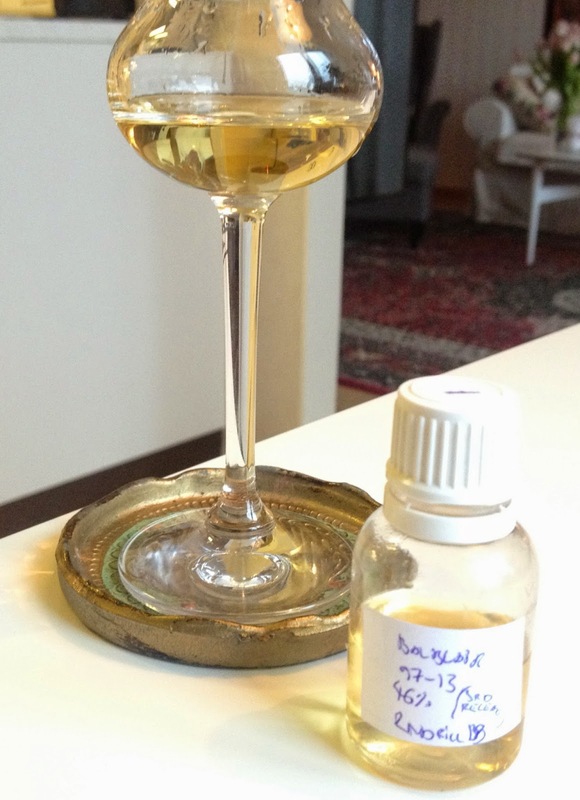 I will for the first time do a tasting note of a whisky from Balblair! 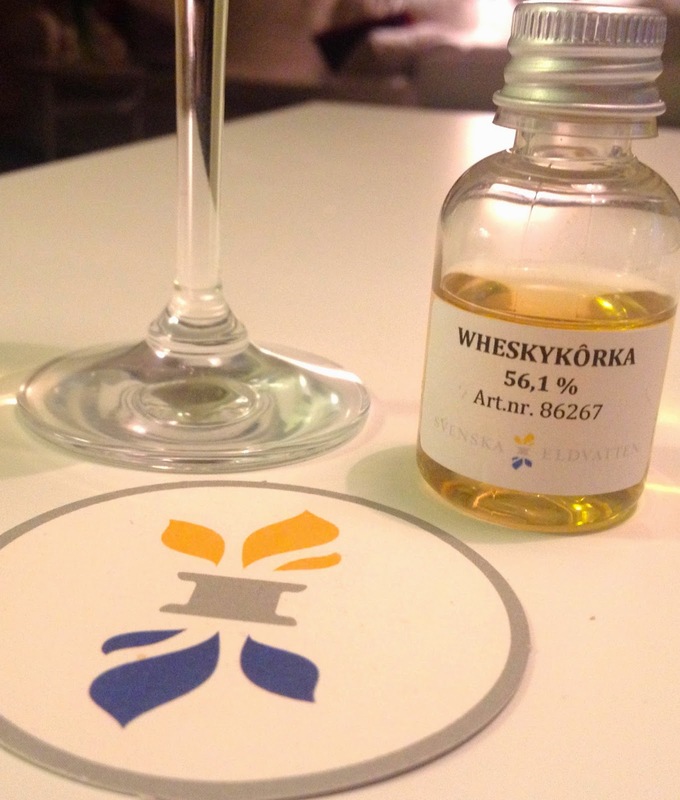 During this years Linköping Whisky Expo I was very lucky to receive a sample from my good friend, and Balblair-expert, Evert who is helping out Berntson Brands at different festivals all over Sweden. So a big thanks to Evert! Balblair is a Highland distillery that was founded in 1790. Now the special thing about Balblair is that in 2007 they started to release their whisky in vintages only: ”Every bottle of Balblair captures the essence of its Vintage year, the year in which it was distilled and laid down in casks”, is what we can understand from the Balblair website. 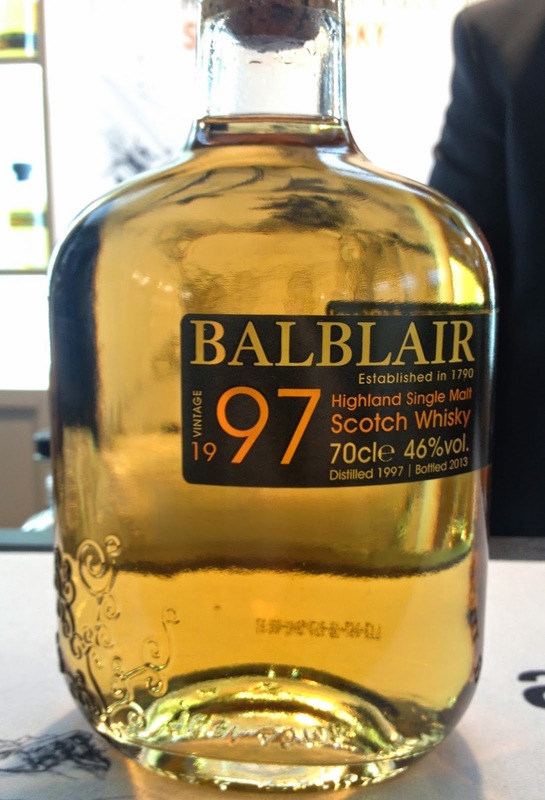 According to Evert, this 1997 Balblair vintage was released 2013 and is the 3rd release of vintage 1997, not the 2nd release, which is a missunderstanding not to be trusted. It has been matured in 2ndfill bourbon casks. Okey, let’s see what’s on the nose! Soft and starts off mostly on a citric sort of sweetness, zesty. More moving towards the sugar syrup and watermelon-/honeydew melon-ish sweetness though than that of the apples, pears and rhubarb that was on the nose. Quite fast after the sweet and citric introduction we get some really nice crushed almonds moving on into almondpaste, moving quite fast, say a second or so, into a bit of dryness, not really herby, but a somehow ”green dryness”, maybe a maltyness. Smacking my mouth and really tasting the aftertaste, here comes the apples, in form of apple peel and a quite dry apple/pear cider, almost somewhere in the background astrakhan apple or distant calvados. Waiting even longer, believe it or not a faint faint touch of liqourice. This Balblair was really interesting to try, classic bourbon matured whisky but uncommon in the way that ist’s very vibrant and very much alive. I give you a heartwarming recommendation to try it. Older Balblair should probably be exciting too, even just to see if they are as vibrant as this one! Please do follow SamuelWhisky on Facebook and on Twitter! On the 1st of April swedish independent bottler ’Svenska Eldvatten’ (’Swedish Firewaters’) released yet another exciting whisky at the swedish state monopoly liquor store. Tommy and Peter was very kind to send me a sample and I was very happy to receive it two days after the release, especially since it sold out that same day! 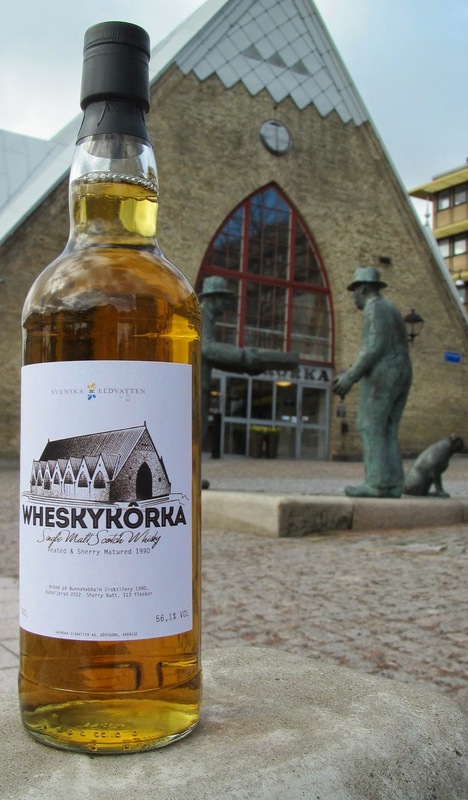 The name of the whisky is a play with words of a famous Gothenburg seafood market called Fiskekôrka (Fishchurch) thus being modified into Wheskykôrka (Whiskychurch). Anyway, the whisky is described as a more than usually peated Bunnahabhain matured in a single sherrybutt that was laid down in 1990 and bottled in 2012. The strength being 56,1% ABV. 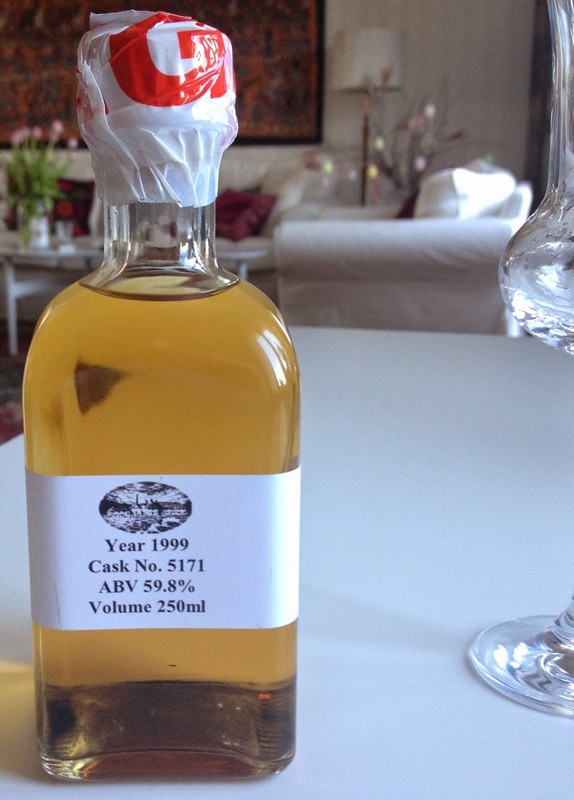 The cask was split between two local whiskyclubs and Svenska Eldvatten leaving 113 bottles for them to release. For whiskyfans outside of Sweden some of Svenska Eldvattens whiskies and rhums recently became available at ’Master of Malt’ so please check it out! Okey, let’s try it! Very soft! The peat is definitely in the background. The sherry-influence is not overpowering, which of course I didn’t really expect judging from the color (but somewhere in my mind I guess heavy sherry was what I longed for ☺). Anyway the sherry-influence is rather soft. What there is a lot of though is milk chocolate, touches of cacao, in combo with some sort of distant mint. The sherry has left it’s mark though with things like very very soft caramelised melted raw sugar and really sugary sultana raisins. 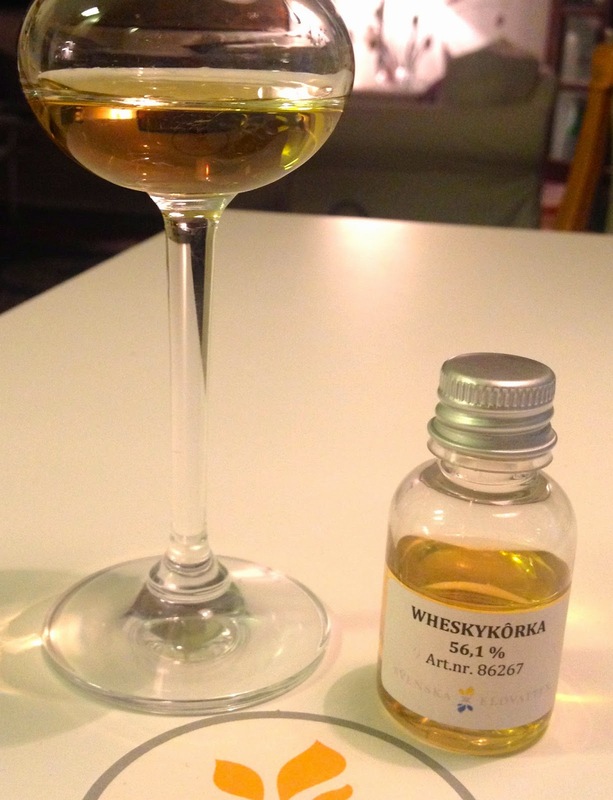 The alcohol is hardly traceable so everything is really soft… a wonderful interplay between the elements of this whisky! When really putting my nose deep in the glass and taking a deep breath there are lots of excotic elements, mostly on citric. Well, my mouth sure is watering which means it’s time to see what’s on the palate! Aha! There is quite some sherry-influence on the palate, but mostly picking up on the caramelised sugar together with the raisins that was there on the nose. Maybe it’s re-fill sherry? Anyhow, in the very center of the palate, or what might be described as the focus of the whisky, we have a steady, firm, peaty-ness. Again, it’s not bursting with peat, not overly peated, but rather, firm and very much present. Surrounding this we have the excotic fruits from the nose, there is something citric yes, but here we also have pears, apples, and even a touch off passion fruit, things that I normally associate with bourbon-matured whisky. Finishing of is something almondy, some dried herbs and strangely enough a little little little aftertaste of ale/beer or it’s probably a malty-ness that I’m picking up on? Yeah, that’s probably it! I think this Bunnahabhain was a very interesting experience, interesting combinations both on the nose and on the palate. Things are very well integrated here people! I was a little bit confused longing for big sherry-influence and huge peat, but no matter, this is a really pleasent experience and I’m really happy to have had the chance to try it, so once again a big thanks to Tommy and Peter of the Svenska Eldvatten, Sláinte! Please follow SamuelWhisky on facebook and on twitter!